After my spot on and spur of the moment purchase of my blue velvet beauties from New Look I have been window shopping for all this season's boots that I would absolutely LOVE having in my show collection. I don't have that many boots right now, but that's only because I've had to throw away the ones I've worn to death! 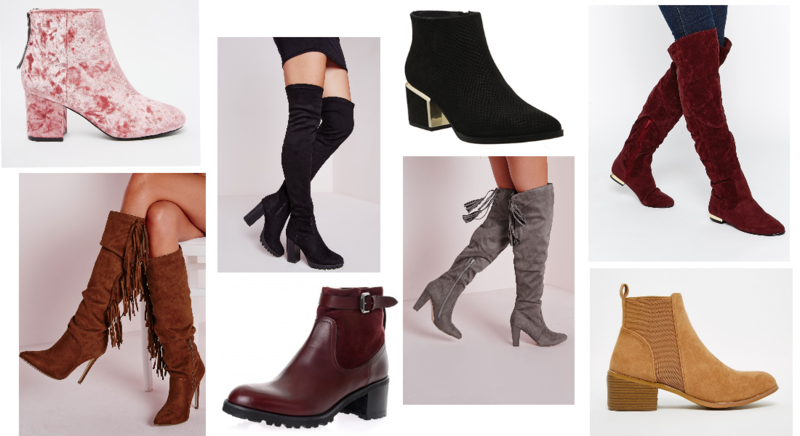 In this wishlist I'm most fond of those grey beauties from Missguided, the oxblood over the knee and the Office metal heeled boots mostly because they'd be the best and most versatile in my wardrobe! And those pink velvet babies from ASOS are amazing too, but I can't even think how they would work for me! Loveeeee!! My fave are those gold heeled black ones, they look so nice! I hear that the boots that come over the knee are the new thing now. You can wear them with a dress and it's like you're wearing tights? Cool concept, but I feel like I wouldn't be able to pull it off!